Can you believe that we're in October?! Its crazy, how fast this year is going and the months are flying by. As the months go, the weather is becoming colder and my skin is feeling the effects, with it being more on the dry side rather than oily. Which means that its time to switch up my skincare and add some different products. The past few weeks, I've been using three products from the Baie Botanique* rose renew range and they've been working some great wonders on the skin. The regenerate line is primarily made up of rose and rosehip, both which have incredible benefits to the skin. They help to renew the skin and leave it looking glowing, young and feeling gentle. The face was has been my go to morning skincare product, to awaken my skin and create a base for my makeup. It claims that you can use it as a product to remove your makeup but for me I don't find it works that well. Its more of something to just clean your face with? The rose extracts in the wash make it suitable for all skin types, even my combination and this along with all the other products in the range, smell amazing. You get 125ml in the tube, a lot more than other washes available out. I use my hands to wash my face with this and it leaves my skin feeling soft and not dry. Its helped to control my blemishes as well due to the rose benefits. Serums are such a powerful skincare product, one that I am desperate to use more. The rose serum is specifically designed for anti-ageing a problem that isn't the top of my skincare worries at the moment. However, I am always looking to incorporate products on the odd occasion to get my skin ready for the future. The serum is the one product of the three that I haven't used as consistently, but when I have it seems to have made a difference. The next day my skin instantly looks brighter and gives me a glow from within. Its definitely one to use the day before you want a dewy makeup look. The serum is very lightweight, sinks into the skin and smells divine. Downside is the price, its the most expensive of the range. When a product has a pump, my love for the product jumps from 0 to 100 real quick. This face cream is amazing if you have combination skin more on the dry side and is my new holy grail. Looking at the ingredients its packed full of rose hip oil, rose water and rose absolute all are plant extracts that work wonders on the skin. With Baie Botanique products being plant-based, not tested on animals, free of scents and colouring the sensitive side of your skin is bound to love it. Using this morning and night has made my skin feel soft, look brighter and overall look amazing. Its by far my favourite of the three. 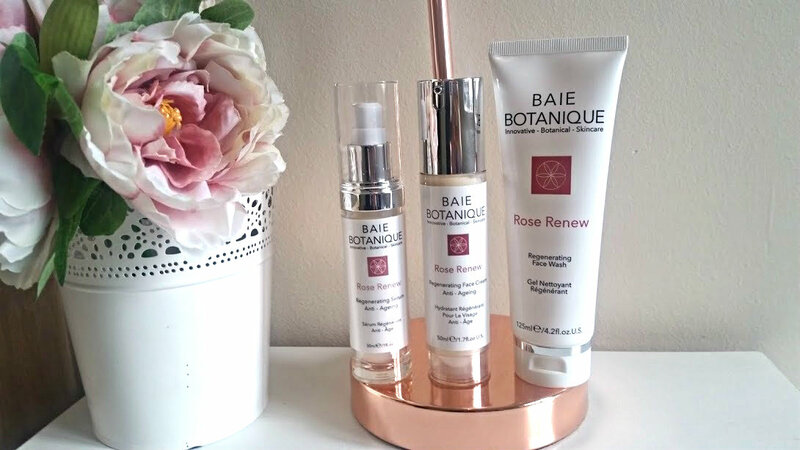 Baie Botanique are a great brand if you are looking for products that are sensitive skin friendly, work in different ways and help to regenerate your skin naturally over time. My skin seems to be loving rose based products, who knew! Now I just need a rose oil!